Looking for corporate gift ideas for the holidays? Send a corporate gift basket or a plant as a business gift to say, "Thank you for your business and support." You can count on Teleflora to deliver professionally arranged business flowers that represent a professional company image. 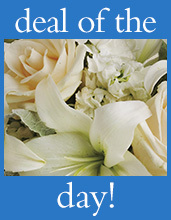 Same-day flower delivery is available for your executive clients all year round and at the holidays. Our high style flowers make beautiful luxury corporate gifts that will look great on the reception desk or in the CEO's office. If you do business with an entire team, consider a corporate food gift. These beautiful arrangements of fresh goodies are presented in elegant wicker baskets and leave a lasting impression with your clients. They will look beautiful and taste great, delighting everyone on team. If you want to send a corporate fruit basket, or an assortment of snacks, there's an option to suit every business. It can be difficult choosing the perfect corporate gifts, which strike a balance between professional and personal. Corporate flowers from Teleflora are hand delivered to the office, ready to be enjoyed immediately, not dropped off with the rest of the day's business deliveries. This personal touch makes your gift stand out, and catch the eye of everyone in the office.